After this awards season, we wouldn't blame Matthew McConaughey if he never wanted to hear "alright, alright, alright" ever again. 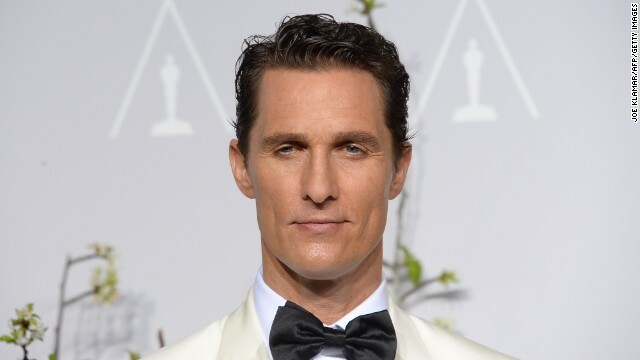 The actor's catchphrase from 1993's "Dazed and Confused" was repeated up and down the red carpet and on nearly every awards show stage as he racked up honors for his work in "Dallas Buyers Club." But before we let those iconic three words go gentle into the night, only ever to be heard on repeat viewings of McConaughey's dramedy classic, let's revisit McConaughey's explanation on how he came up with the oft-repeated saying in the first place. While appearing on "George Stroumboulopoulos Tonight" in 2011, the actor recalled being inspired by Van Morrison for his 1993 "Dazed and Confused" character Wooderson, which was his first feature film role. "I'm nervous, first scene ever on film, and right before we're about to shoot ... I've been listening to this live Doors album. And in between two of the songs, (The Doors' Jim) Morrison goes, 'alright, alright, alright, alright,'" McConaughey said. "So right before we go on, I'm like, what is (my character) Wooderson about? Man, he's about four things: he's about his car, he's about getting high, he's about rock 'n' roll, and picking up chicks. And I go, I'm in my car, I'm high as a kite, I'm listening to rock 'n'roll - action! And there's the chick! Alright, alright, alright." Next entry »What do the new 'Mad Men' photos tell us about season 7? So that proves it! Jim Morrison didn't die after all. He was really Van Morrison in a wig all the time. And he had Janet Planet AND Pamela Courson. No wonder they call him Van the Man. Oh... This story is too sad for words. It's JIM Morrison... JIM – not Van! (Really?!! Really?!!) Can I come write for you? I'd never screw up this badly! What's too sad for words is that you think there's only been one singer with the last name Morrison. * VAN* Morrison is a well-known singer/songwriter. He just didn't overdose and die at age 27, so he's not infamous. The next time you hear two adults speaking about something you don't understand, do some research before you assume that they are wrong. Before you try to tell someone learn to read yourself. It was actually "JIM" Morrison that the writer really meant to say. So it doesn't really matter if anyone knows Van Morrison or not. He's not relevant here.